IKEA is best known for its ready-to-assemble furniture, but the Swedish retailer has produced some cult food items as well. 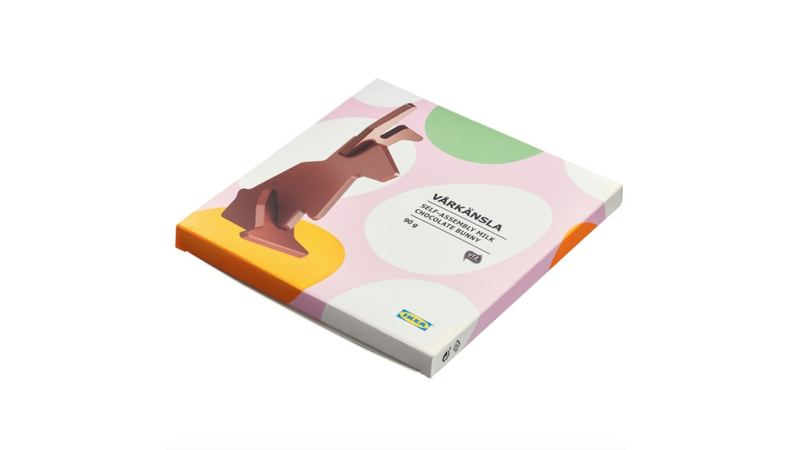 A new product combines the brand's two specialties: As Business Insider reports, IKEA's new chocolate bunny comes in three pieces that fit together like one of the store's famous flat-pack furniture sets. Released ahead of Easter, which falls on Sunday, April 21 this year, VÅRKÄNSLA makes you work for your candy. The components—legs, a body, and a pair of ears—lay flat in their pastel polka-dotted box. After joining the parts together, you have a 3D figure that's ready to stand up in your Easter display—or be consumed right away. The milk chocolate bunny is made with 30 percent cocoa and costs $4.91 for 3 ounces. It's now available in IKEA stores in the UK, but there's no word when it might arrive at U.S. locations. This isn't the first time IKEA has experimented with creative foodstuffs. Last year, the company released veggie hot dogs made from kale, lentils, and carrots, and IKEA's test kitchen has developed meatballs made from bugs and algae. It seems like Society6 is constantly coming up with more and more products that you can get emblazoned with your favorite artists' work. From notebooks to shower curtains, we're getting to a point where an entire apartment can be covered in artful sloths. And so can your phone. 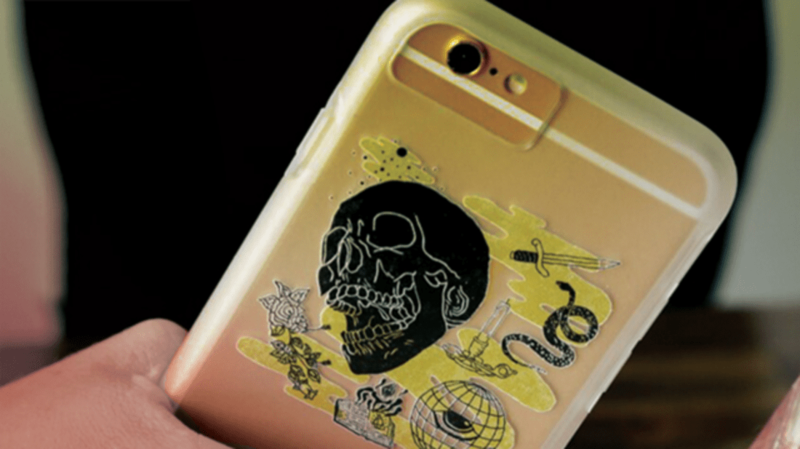 The art print site's clear iPhone cases are transparent and incorporate the look of the phone underneath into the design. Often, the patterns look like stickers, but with the advantage of never peeling. The protective cases come in two versions: slim (a frosted plastic case) or tough (a two-piece, impact resistant case) and are available for $36 for iPhone 6 and later. We collected all our favorite designs to give you a quick look at what's available. A version of this story first ran in 2017. It has been updated to reflect current availabilty. Motorists driving through Medford, Massachusetts may notice something unusual on the street outside Brooks Elementary School. On April 22, the city installed a new pedestrian crosswalk painted to look like 3D objects raised from the ground. The new crossing path aims to make the intersection safer, and it's one of several set to debut around Medford, Curbed reports. By painting additional, shaded shapes around the traditional white strips of a crosswalk, the city was able to create an optical illusion for drivers. From far away, the flat shapes look like blocks in the middle of the street. The effect is meant to make drivers slow down before they reach the crossing, and to make them more alert to pedestrians in the area. Two students—a fourth- and a fifth-grader—worked with their teacher and the Brooks Center for Citizenship and Social Responsibility to convince the city to add the safety feature. The 3D walkway, designed by Boston artist Nate Swain, will be painted outside three other elementary schools in the city. 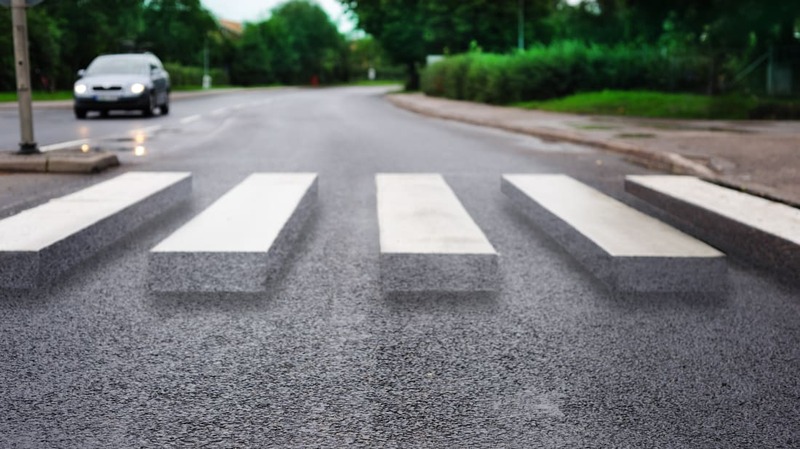 Medford is the first city in the Boston area to experiment with 3D crosswalks, but the illusion has been used for years in other parts of the world. In 2016, Shakuntala Pandya and her daughter Saumya Pandya Thakkar designed their own version of the blocks for a highway in Ahmedabad, India, and in Chicago, the crosswalks have been around for nearly a decade.